Truimphant fist-pumping at an award ceremony; a joyous group celebrating the year's performance in Malacca; a eureka moment for an engineer who designed a new product. These are among the many memories plastered on a wall in the office of Superworld Electronics. These photos are visible reminders that the company values relationships it has built over the years. Stepping into Superworld's premises, one is greeted by a world of maroon jackets and maroon workstations, reflecting the company's colours. "It is our culture that everybody wears the Superworld jacket when visitors are around," says Johnson Chen, founder and managing director of the company. "Most importantly, because the top management does it, the employees will follow." The culture has been painstakingly built up over the past 20 years. With this strong foundation, Superworld has grown from a component electronics start-up that helped others to market and sell their products to a more vertically integrated enterprise with its own design and manufacturing capabilities as well. The five-time Enterprise 50 award winner, ranked third last year, now has seven manufacturing facilities in China and Taiwan. Singapore remains Superworld's global headquarters, housing the prototyping, logistics and sales functions. Through its sales offices and agents across the globe, Superworld sells component electronics to other businesses. Its products include multi-layer chip beads, power inductors, transformers, connectors and cables. Customers then use these in their own manufacturing of electronics end-products such as mobile phones, electronics controller, LED lighting, hard disk drives and graphic cards, for both industrial and consumer end-customers. 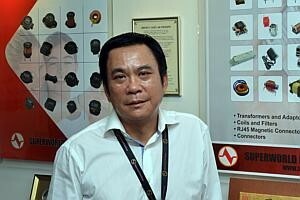 Starting out as a marketing and sales agent for its supply partners in 1993, Superworld and its partners "got to know each other's working style better, and began to work more closely together", says Mr Chen. "Eventually, we decided to have cross-equity holdings." With cross-ownership, Superworld can be more confident of the product quality and on-time delivery performance of its suppliers. Knowledge sharing is one area that Superworld and its partners find useful. Superworld provides customer feedback to its suppliers, helping them to understand industrial trends from a customer perspective and to design new magnetics products. Conversely, suppliers who engage in research and development can let Superworld understand the possibilities of technology and launch the latest component electronics. Adeline Wong, senior director of Superworld, cites a company practice that illustrates the importance placed on responsibility, and also shows how the office is akin to a second home to all employees. "We do not engage a cleaning company to help us clean our tables, throw our rubbish and vacuum the floor," says Ms Wong. "Instead, we do everything ourselves. We have a daily routine, a weekly roster. How can you manage the business if you can't do the simple things like cleanliness well?" Mr Chen points out: "When we interview people, we must let them understand our culture." When Ms Wong interviews potential hires in Singapore, she explains the rationale for various company practices. Upon joining Superworld, employees receive a handbook which goes into further detail about the expected behaviour and the rationale. These steps help dispel any reservations of fresh hires. One way that Superworld seeks to win the dedication and support of its employees is to proactively gather their opinions and feedback. Finance and administrative manager Joanna Lim shares how management actually takes into consideration feedback. "We hear what they want," she says. "When we plan our cohesion activities and quarterly events, we give staff a list of options to vote for, and welcome other suggestions too." For example, in response to employee comments that they found it troublesome to go to a gym or go outdoors to exercise after work, Superworld asked employees for their preferences for healthy activities. Subsequently, the company engaged an external instructor to conduct Zumba (a dance fitness programme) classes in the office after work. In addition, each employee receives at least 15 hours on average of training annually. Some of these hours last year were used for the learning of SAP applications, since Superworld migrated to the SAP system in 2010. Others are more job-specific. Such efforts contributed to the sales per employee doubling over a two-year period. Ms Wong started at Superworld in the shipping department, processing deliveries. Recognising her hard work and dedication, her supervisors gave her more responsibilities and the opportunity to rotate across different functions. Today, as senior director, Ms Wong takes charge of Superworld's entire Singapore business. In view of the rising labour costs in some of its manufacturing locations, Superworld is considering setting up factories in inland China and in countries where it currently does not have a presence. As a way to improve cohesion, the company plans to organise more activities that allow employees to engage and interact with the local communities. Employees will also understand that they have responsibilities not just to suppliers, customers and shareholders, but also to the community. At the same time, this will allow more people to be aware of the Superworld brand.